Alpine touring is a splendid mountain sport that combines ascension with skins and alpine downhill. You might have already tried it, but if you haven’t, you must know that, to ensure a successful outing, it is imperative to use the right equipment and apparel. Our Boutique Explore! experts have tips and tricks to fully enjoy your tour. 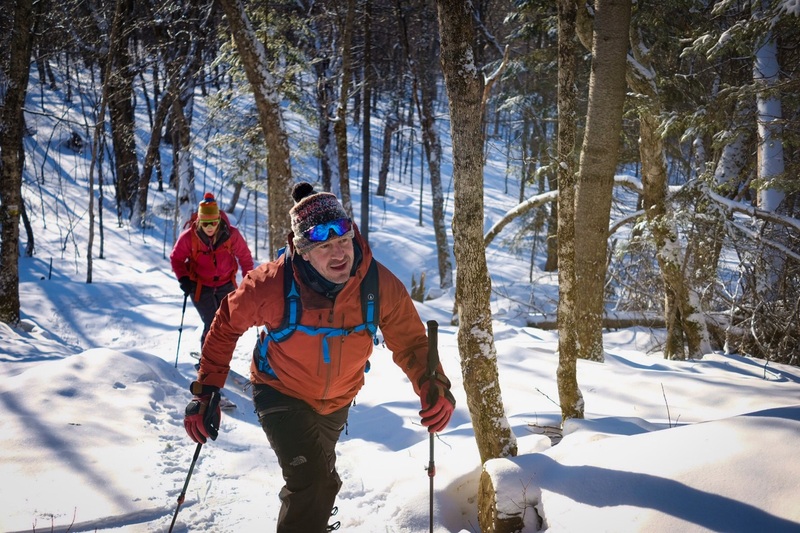 This sport is gaining in popularity and the equipment is quickly evolving to maximize alpine touring outings. Although they are similar to alpine skiing boots, alpine touring boots have a bigger amplitude span in the upper part of the boot. Poles are telescopic to adjust when you go down. Skis are larger but lighter and have specific alpine touring bindings. For clothing, Explore experts advise you to opt for multiple layers in order to better manage body heat. For the first layer, they suggest opting for merino wool as it insulates better while evacuating humidity and perspiration. Since it is hard to stay dry during the ascent, it is not recommended to wear cotton for the first layer. According to the temperature, a synthetic fibre layer could be required to stay warm. A windbreaker could also prove useful. It is recommended to bring a small backpack for alpine touring essentials. Since this sport pushes the cardio system, it is important to bring a water bottle to stay hydrated. Protein snacks and a warm drink in a thermos are also good options for a boost of energy during your outing. Also plan on bringing dry clothes to change into once at the summit and warm gloves or mittens for the way down. A warmer jacket, helmet and ski goggles are also required for a good experience skiing down. For alpine touring, everything starts with the feet. Using the right socks and the right boots will make the difference between a good and a bad day on the mountain. Our experts recommend to use ski socks to maximize comfort and avoid getting blisters. This way, you can fully enjoy your experience. With these tips and tricks, you are ready to put your equipment on and hit the beautiful alpine touring trails. Don’t hesitate to reach out to your experts at Boutique Explore! to learn more about the equipment! See you on the mountain!